Johnny is a 16 year-old grade 10 student. Since entering high school he has found that he is struggling with his course work and his grades are falling. Johnny is having difficulty successfully completing and understanding his work and he is not performing well on math and English tests. His teachers referred him for educational and psychological testing in order to determine the cause of his difficulties and the results have indicated that Johnny has a learning disability. Johnny’s mom thinks that the teaching styles that were used in elementary school enabled Johnny to get by but now high school is a more intense learning environment and Johnny does not possess the learning skills that are necessary for him to perform to his potential. Since being formally identified with a learning disability, his principal and teachers feel that Johnny should be placed in a separate special education classroom. They feel that this is where the proper instruction can be given to Johnny and will help meet his needs. Johnny on the other hand does not want to leave his friends and wants to stay in a regular classroom setting. What are Johnny’s Rights in this situation? In this situation, it seems that Johnny, his parents, his principal and teachers are waiting for a reference to the Identification, Placement and Review Committee (IPRC). 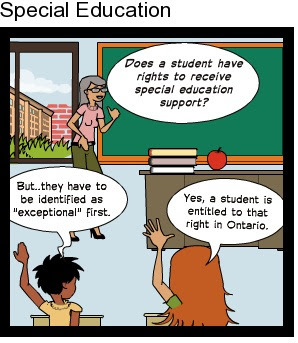 The IPRC is the committee that will decide three things: 1) whether Johnny is “exceptional” (ie has special learning needs), 2) what type of exceptionality does Johnny have (behaviour, communication, intellectual, physical, and multiple); and 3) what is the appropriate special education placement for Johnny. Johnny’s parents can request an IPRC by writing a letter to the school Principal. The law says that the principal cannot refuse to refer the student to an IPRC. A Principal can also refer a student for an IPRC without a parent’s request. - The right to attend his IPRC and to give the committee any information he thinks is useful in deciding his educational needs. In this case, Johnny could present his preference for staying with his current classroom setting because the support of his friends is beneficial to his learning. - He is entitled to receive a copy of any information about him that others will give the IPRC. Johnny is entitled to see a copy of the educational and psychological test results that his teachers registered him for. - The opportunity to be consulted about his Individual Education Plan (IEP), which contains specific learning expectations and the school’s outline of educational services to address them. In this case, Johnny may request a less intrusive method of service, such as an educational assistant, so as to allow him to stay in a regular classroom setting. - His parents can be present. - He may bring an interpreter if needed. For more information, take a look at this pamphlet on special education.